Thanbyuzayat War Cemetery, Plot A10, Row E, Grave 7, Age 22. Grave No. 12, by Lieutenant-Colonel Eadie from 2/2nd Casualty Clearing Station. Wounded in action on 22.2.1942 during an enemy air raid at Semplak Airfield whilst with 2/2nd Pioneer Battalion. Evacuated to a Dutch Military Hospital in the Batavia area. He was at Cycle Camp receiving treatment for tinea from 5 August 1942 to 15 August 1942. Stuart Foxall was AWOL at Fremantle, and with about 90 men from 2/4th missed the departure of ‘Aquitania’ when it sailed for Singapore on 16 January 1942. Read further about Blackforce and those AWOL Fremantle. The group then made their way towards Singapore, initially planning to arrive in Java and then be transhipped to Singapore. However it became clear the Island would fall and they remained at Java where they joined forces with other Australian, Dutch East Indies, Americans, etc. however soon became a POW of Japanese. Stuart was selected with ‘A’ Force Java Party No. 4 Williams Force to work on the Burma-Thai Railway. They first sailed to Singapore arriving on 12 October 1942 and departed on 14 October sailing to Burma. ‘A’ Force included 3,000 men. Tragically Stuart contracted Cholera and died in July 1943 at Beke Taung 40 Kilo Camp, Burma at the age of 22 years. Stuart Foxall was the youngest of two sons born to John (Jack) Stuart Foxall and Mary Josephine O’Grady who married in 1914, Gwalia where Mary was a teacher at Gwalia State School and Jack Foxall was an engineer with Sons of Gwalia Mines. Mary’s sister Eileen was a teacher at Leonora. In 1916 Eileen transferred to Fremantle Intermediate School. The two sisters were close. Jack Foxall was born Ryde, NSW in 1889. Stuart’s older brother christened John Desmond Foxall was known as ‘Jack’ like his father. 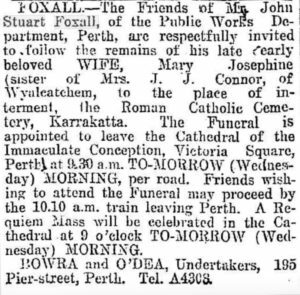 The first tragedy for this family was the death of Mary Foxall in Perth, 1923. Believed to have been ill, she was 31 years old. Stuart would have been at the most 3 years old and Jack (Jnr) would have been about 5 years. 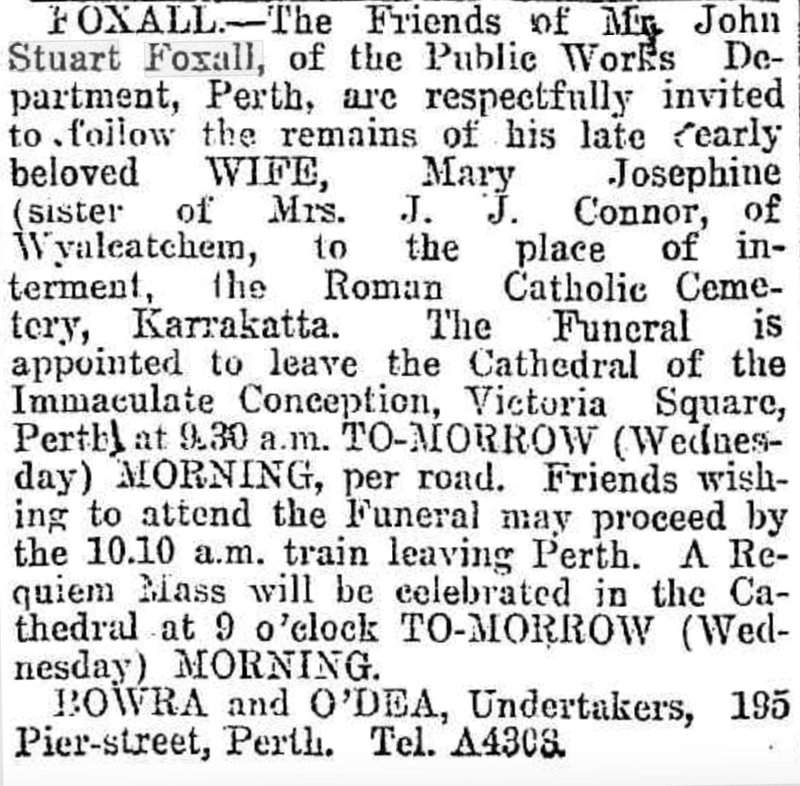 In 1928 Jack Foxall (Snr) remarried. In 1936 the Foxall family endured another tragic young death. John Desmond Foxall aged 20 years died 1936 at Gwalia mines. An Inquiry found his death was accidental and there was no one else involved or responsible. He had recently completed University exams and had been working for 3 months, had knowledge of chemistry and was employed as a produce fireman and engine room assistant. In August 1940, Stuart Foxall enlisted in AIF. He joined the 2/4th and became a Corporal with ‘C’ Company at the age of 20 years. Stuart died in insolation cholera ward at at 40 Kilo Camp, Burma in July 1943 aged 22 years. He had been ill with fever, diarohea and malnutrition . He was buried at 40Km gave 12 and in attendance was VX14845 Col. N.M. Eadie, C.O. 2/2 CCS, a Consultant Surgeon from Melbourne.